"It's just a little bit spooky, you know"
Because it was the middle of the night, Covent Garden was shut, and there were hardly any people there. 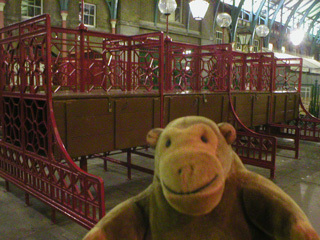 Mr Monkey was able to examine the market stalls, which are usually covered in colourful goods and hidden by eager customers. 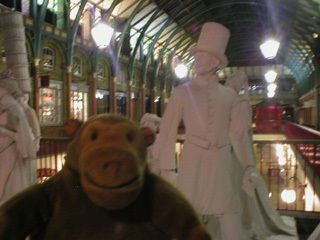 He was a little alarmed by what appeared to be a gang of ghosts but turned out to just be some dummies representing former occupants of Covent Garden.